The 6+ hour reading of the Law of Moses has generated some strong emotions in those who are listening. They are weeping and grieving. If we can agree that tears are samples of our souls, and that they reveal important clues about what is going on with our spirit, then what does this response mean for the spirit of those who are listening? I have been pondering and praying about this and I have come up with a couple of options…there are probably more but these are the ones that came to mind as I was walking my dog in the blustery Michigan snow. 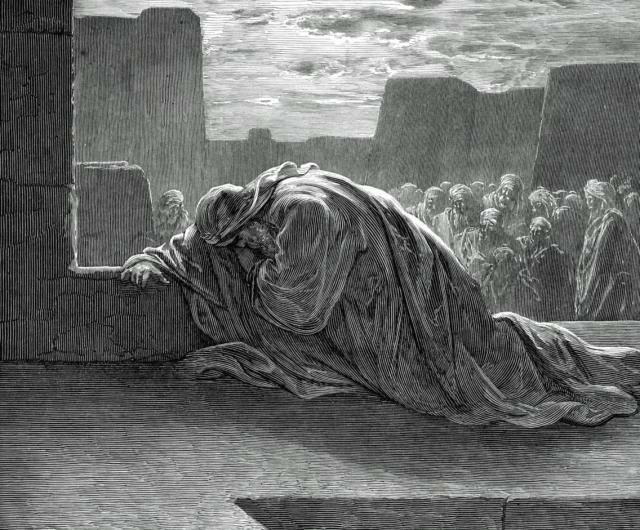 I think the tears may mean the Israelites: 1) are really tired and exasperated with Ezra for reading the law for over six hours; 2) are grieving the loss of the lives they had been living (i.e. the foreign wives and children that they would have to give up); 3) are sad because they have heard and understood the law in a new way and feel overcome with the “weight” of it; 4) are weeping because they feel guilty for their past behavior; 5) are weeping because they do not know how else to respond to this new intimacy God is trying to build with them. Of course their weeping may mean something else than I have thought of too. I find it interesting that Nehemiah comforts the people by saying “Do not grieve, for the joy of the Lord is your strength.” This would imply that the Israelites were feeling overwhelmed by the sheer weight of the Law of Moses and they did not feel they had the strength to live up to it. They sensed that this law required them to deny themselves and faithfully follow God….that is hard. C.S. Lewis once gave a sermon once called “the weight of glory”. In it he makes the point that self-denial is not an end in itself. There is no glory in a monastic life if that life does not lead us to pursue God with more passion and zeal. I think that is the response that God, and Ezra, were looking for from the listeners in this passage. God wanted them to realize they had fallen short of the law and pursue God as their strength to make up the difference. We are called to do the same as Christians. Jesus calls on us to do very hard things like love our enemies and lose our life so that we can find it. We all fall short (Romans 3:23) and it is our job, just like it was the job of the Israelites, to look to God to make up the difference. This entry was posted in Christian Community, Conflict, Covenant, Discipleship, Faith, Following God, Life Together, Love for the Lost, Nehemiah, Obedience, religion, Sin, The Spiritual Realm, Trusting God and tagged bible, bible study, Christianity, Daily devotional, water, weeping. Bookmark the permalink. Amen! Great write! I enjoyed reading this! I love learning about God! I look forward to reading more of your posts. Have a great night.